AUDUSD is under the influence of some economic reports such as the Reserve Bank of Australia’s interest rate statement and Building Permits MoM in Australia and ADP Employment Change in the US. 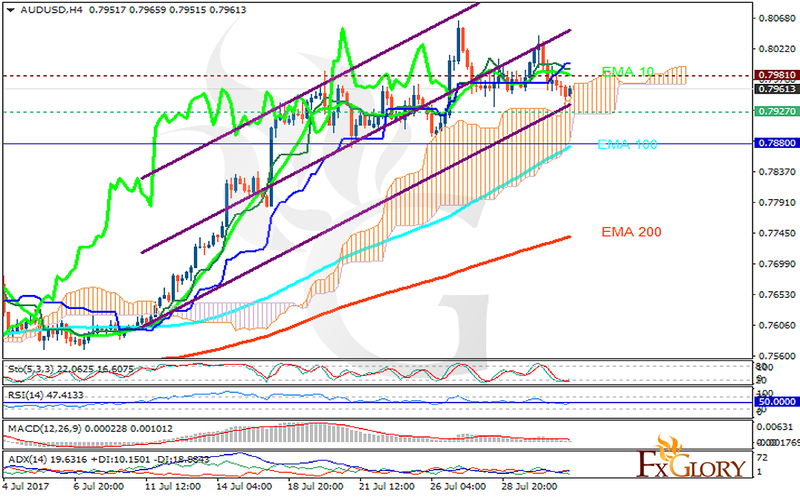 The support rests at 0.79270 with resistance at 0.79810 which both lines are above the monthly pivot point at 0.78800. The EMA of 10 is moving horizontally in the ascendant channel and it is above the EMA of 100 and the EMA of 200. The RSI is moving on the 50 level, the MACD indicator is in neutral territory and the Stochastic is moving in low ranges. The ADX is not showing any clear signals. The price is in the Ichimoku Cloud and above the Chinkou Span. The Tenkan-sen and the Kijun-sen are both showing a horizontal trend. It is difficult to see the trend direction therefore if the support level is broken, the pair will drop to 0.7900 otherwise it will rise towards 0.90.